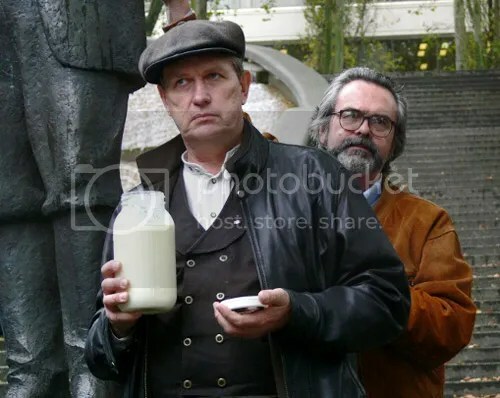 Michael Schmidt and Gordon Watson, on the steps of the BC court house. 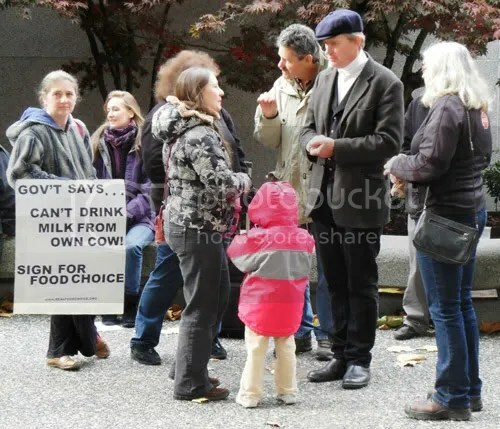 Ontario raw milk advocate Michael Schmidt and BC raw milk pioneer Gordon Watson were found guilty today, on charges of contempt, by Mr. Justice Wong of the B.C. Supreme Court. The charges relate to an order dating from March 18, 2010, given to former “Home on the Range” cowshare farm agister Alice Jongerden to cease and desist the farm’s raw milk operations. Gordon Watson, cowshare member of the former Home on the Range cowshare, and Michael Schmidt, at speaking engagement in the United States, where he is currently not allowed to travel. “ Both respondents, Michael Schmidt and Gordon Watson are guilty of civil contempt. Both respondents are sentenced to a term of imprisonment of 3 months suspended with a probationary period of 1 year. Any repetition of this contempt during the probationary period will trigger the imposed sentence imprisonment of 3 months. Read the full reasons for judgement here. Here’s an earlier story about the February 2013 court case that led up to this judgement. we live in a country where you can buy cigarettes & alcohol, fast food full of sugars & fats, junk food laced with caffeine & more sugar, over the counter medicines to make any concoction for any malady, there are food recalls almost every day, food that has been inspected and deemed safe by the CFIA. Why can’t we make a choice for ourselves about what food to buy and from whom . If we know the producer and are satisfied with the conditions of production and handling, then it should be our choice. My nephew can’t drink store bought milk, gives him the shits & cramps. Doctors told him he was lactose intolerant, he can drink fresh milk from their jersey, doctors & experts explain that ! I know the answer. 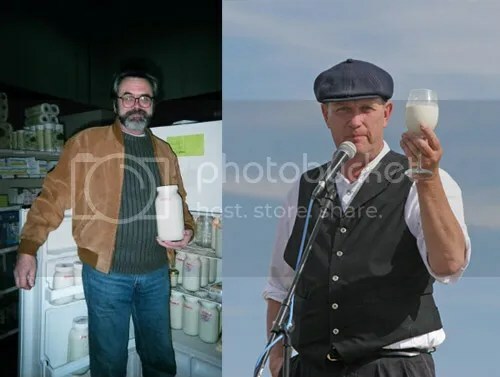 “Convicted” of a raw milk crime. Surely the judge will wake up one day and smack himself. I grew up on a dairy farm with raw milk. Was better for me than this white treated stuff they pass off as milk that makes me sick. I grew up on raw milk! I’m 65 and have no alergies and I am very healthy. This is all about politics! The judge should drink the raw milk and maybe would have bigger and healthier brain! Pingback: Got Hair! Cut for Food Freedom. I once thought that the government officials would be “reasonable” and the courts would come to our aid. I now know that was delusional thinking. The only way through, is to fight for our food freedom. Did anyone notice exactly when we lost all our freedoms when it comes to personal choice re: healthy natural foods and supplements? ?